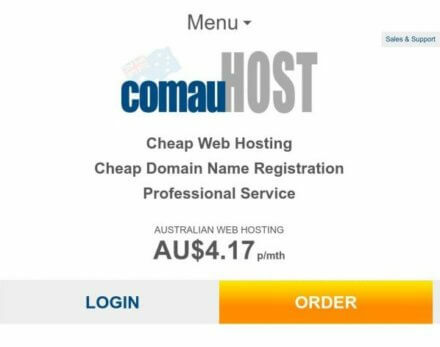 For a simple and affordable Australian web hosting solution, check out comauHost. The company only has one package on offer: a shared hosting plan that delivers unlimited disk space and bandwidth, plus web hosting staples like cPanel and the Softaculous installer. You're limited to a certain number of domains, but the company makes up for that with handy services like free setup and migration. With a Brisbane-based data center, comauHost guarantees faster performance and low latency for your Australian visitors. However, the company doesn't offer an uptime guarantee, so be sure to take advantage of its refund policy to check out comauHost's services before signing up for a long-term contract. 30-Day Money-Back Guarantee: If you cancel your account within 30 days of registration, you're entitled to a full refund. Unlike other providers, comauHost offers you just one straightforward hosting plan: shared hosting for an initial price of $5 AUD a month, with the potential to get a lower price depending on your chosen billing cycle. Despite the low cost, comauHost manages to pack in some hefty resources. For starters, you’re getting unlimited disk space and bandwidth, which is more than what you’re likely to get from many competing providers, and certainly a good deal for $5 AUD a month. This is undercut a bit by the limits placed on the number of domains you can host, though. At comauHost, you can only have a maximum of 5 add-on domains and 10 parked domains, plus you don’t get any deals for free domain registration with your hosting plan. This isn’t that big a drawback if you’re only planning to host one (or a few) websites, but those with more complex domain hosting structures in mind should take note of these restrictions. That said, you can host an unlimited number of subdomains, email accounts, and FTP accounts. There’s also support for MySQL databases, so you can host as many of those as you like, too. You’ll get phpMyAdmin to help you administer your databases. You’ll also have a number of tools to support email: unlimited forwarders and aliases, autoresponders, and support for webmail clients, just to name a few. For more advanced or complex functions, rest assured you won’t have to start from scratch. You’ll have the Softaculous script installer free of charge, giving you access to hundreds of popular and powerful web applications like WordPress and osCommerce, which you can install in just a few clicks. If you’d like to deploy your own custom scripts, comauHost supports popular languages such as PHP, CGI, Perl, and SSI. As for performance, comauHost uses high-performance servers, so you’re assured of high speeds and snappy query processing. The company’s data center is located in Brisbane, so you can expect low latency and even faster performance for Australia-based visitors. If you’d like to monitor your account and website’s statistics, comauHost has you covered. The company issues regular bandwidth reports, and you can view website statistics through AWStats and Webalizer. Those tools are all accessible from your cPanel control panel, which is the industry standard for account and domain management software. Thanks to the easy-to-use cPanel interface, managing your account will be a breeze. comauHost also supports custom cron jobs, so you can even automate many of your important maintenance tasks. You’ll get free setup for your account. If you have an existing website or cPanel account, comauHost will also transfer those for free. The company also offers 24/7 network monitoring to make sure you’re always on top of any connectivity issues your website might experience. If you ever find yourself in need of more resources, comauHost will also help you scale up your hosting package seamlessly. You can buy additional dedicated IP addresses at a cost of $50 per address every year. This is a necessary purchase if you’re going to use an SSL certificate, especially for any e-commerce ventures. Speaking of certificates, comauHost offers RapidSSL certificates for $40 per year. If you’d like to use certificates from other providers (for example, a premium Wildcard SSL certificate), tough luck: comauHost doesn’t install SSL certificates from external sources. If you need more resources, you can also purchase additional CPU cores and RAM for a minimum of $50 per year. You’ll have to sign up for long contract terms if you decide to go with comauHost. The company only offers billing cycles of 1, 2, or 3 years, with discounts for the 2-year and 3-year payment terms. Annual billing is at $60 AUD per year, biennial at $55 AUD per year, and triennial at $50 AUD per year. The company offers a money-back guarantee for its hosting services, though, so you have some time to see if it’s a good fit for your needs. You can claim a full refund as long as you file for cancellation within a month of registering for your account. Unfortunately, comauHost doesn’t offer any uptime guarantees for its services. As the company’s terms of service state, you can’t request compensation for instances of unscheduled downtime. comauHost provides customer support through email and their support ticket system, though there are no guarantees of round-the-clock availability or quick response. The company also maintains a knowledgebase and FAQ that you can consult for assistance with common issues and problems. Blog posts with detailed instructions for common procedures like installing WordPress or migrating websites are also available. What's the Verdict on comauHost? If you’re looking for a simple, no-frills Australian web hosting solution that won’t break your budget, check out comauHost. You’ll get unlimited storage and bandwidth for a relatively low price of $5 AUD per month, as well as all the standard features you can expect from a shared hosting plan. The lack of an uptime guarantee and the long contract terms are notable downsides, but the company does give you a 30-day money-back period so you can see if its perks are worth those costs. Overall, for budget-conscious users with modest resource needs, comauHost is an affordable option. comauHost migrated 5 of my sites over to them from GoDaddy about 4 months ago. It was so easy I was suspicious of what was not happening but they all work fine. I’ve called on them for support a couple of times with minor glitches resulting from the move but their response is like measured in minutes and they just fix it, so from m point of view, they’re brilliant and cheap. Better than shelling out a couple of hundred at a time for GoDaddy when they provide the SSL included. One very happy camper.